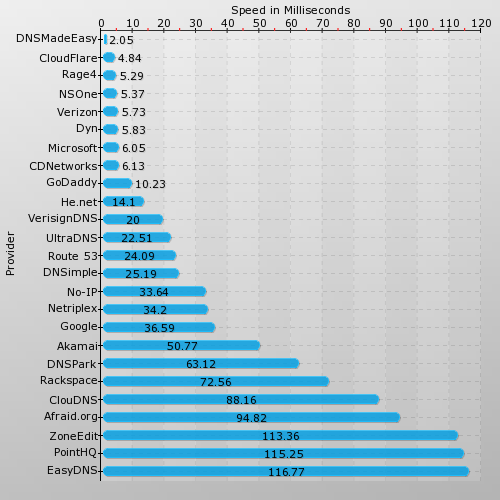 DNS Made Easy has been named the fastest DNS provider in the world during the month of July. This is the eleventh month in a row that DNS Made Easy has been the fastest provider, according to SolveDNS. SolveDNS is a third party network monitoring firm that monitors the top DNS providers from seven critical peering locations around the world. SolveDNS also ranked DNS Made Easy as third in the industry for market share. Three months prior, a separate study by Network World found similar results during the same month, with DNS Made Easy edging out the rest of the industry as the fastest provider. DNS Made Easy’s newest product offering, Constellix DNS, is emerging in the industry as another major player for the fastest query response times. “As history has shown us, DNS performance is multifaceted and depends on multiple strengths to deliver consistent speed and availability. Clients should expect excellence across the board when evaluating managed DNS providers,” says President of DNS Made Easy Steven Job. DNS Made Easy has recently led initiatives to educate current and prospective clients about the importance of DNS performance as a whole. While speed can ensure timely delivery of DNS information, if the provider’s network doesn’t have enough fail-safes or capacity there will be no deliverability at all.